Murder. Many of us have contemplated it at some point, at the very least to consider what we'd have to do to get away with it. But as it turns out, you might not have to try that hard to avoid the consequences, if you choose the right Bay Area city in which to commit your crime. According to ABC7, "criminals have a very good chance of getting away with murder in several Bay Area cities. Those police departments do a poor job of solving homicide cases, compared to other departments around the bay and the nation." This "poor job" is highlighted by the Murder Accountability Project, an unassuming blog with a massive mission: To track all of America's unsolved homicides. Founded by former White House correspondent Thomas Hargrove, the retired investigative journalist assembles summary and individual case data from the FBI's Uniform Crime Report and their Supplementary Homicide Report, and so far has stats stretching from 1965 to 2013. It's quite engrossing, especially if you are a crime nerd like me. One of the things Hargrove discovered, he tells ABC7, is that back in 1965, about 90 percent of the homicides committed in the US were solved. But that number has steadily dropped year after year, and by 2013, the US clearance rate was down to 60 percent. That average gets even lower when you look at Bay Area specific data (once again, this is data that local departments report the the FBI, so it's enough of a game of bureaucratic telephone that slight discrepancies are possible!) from 2009-2013 (which you can in this document). While some cities have clearance rates that knock it out of the park (Sonoma, impressively, had only six homicides from 2009-2013 but cleared eight), others look far weaker. 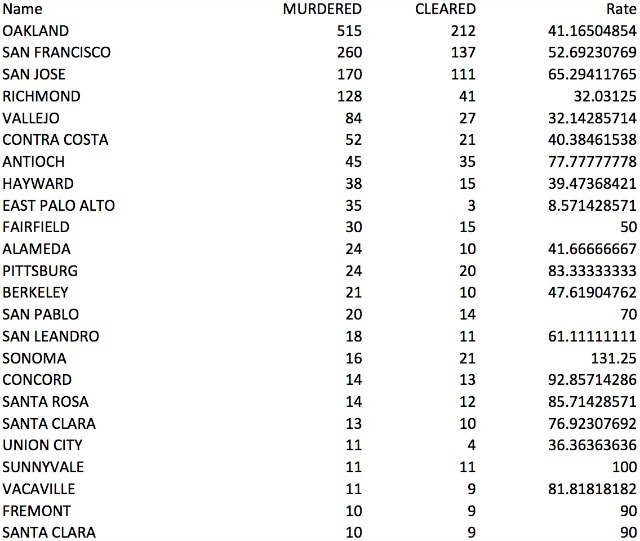 For example, from 2009-2013 Oakland had 515 homicides and cleared 212, giving them a rate of only 41 percent. East Palo Alto looks even worse, solving only three homicides of their 35 during that period, for a rate of 8.5 percent. Why are fewer murders being solved? Hargove says that a big factor is "because of better intervention techniques to kill a spouse or girlfriend," fewer "crimes of passion" (as they are called) are committed. Which is a good thing, I think we can all agree! But then, he says, "so what are left are some kinds of murders that are more difficult to solve." In other words, now that the TV crime trope of "the significant other is always the killer" isn't as true, police aren't sure who is. The way to better clearance rates, ABC7 posits, is "manpower and a lot of overtime in those crucial 48 hours after a killing" and "police chiefs have to help those victims' families and make these cases a priority, and politicians and voters need to give departments the resources they need." "I mean, it's like a war," Hargrove says. "In fact, you count homicide as a conflict, the murders committed since 1980 are one of the worst wars that America has ever experienced." "If you really study the problem, how can you not have a sense of outrage?"